On our first night in Siem Reap, me and Chichi had a meet up dinner with some fellow Asian bloggers at a Mexican Restaurant called Viva on Pub Street. On our way to the restaurant, we spotted some interesting places to visit on the following nights. There were Amok Restaurant (who claim themselves as the best Amok Restaurant in Cambodia), a nice ice cream parlor across the Art Market, Cambodian massage, etc. But a friend of Chichi tweeted and recommended us to come to a cafe that has something called “the best apple pie in the world”. 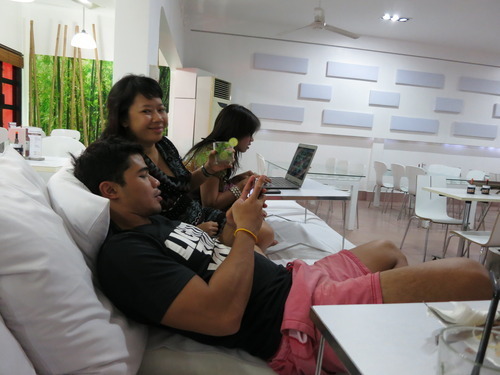 Soon after we met at the Mexican resto, we looked for a cafe where Tonyo was sitting waiting for us to come. It’s a café that has “cool chairs and ice cream”. Apparently it was the cafe that Chichi’s friend recommended on Twitter. 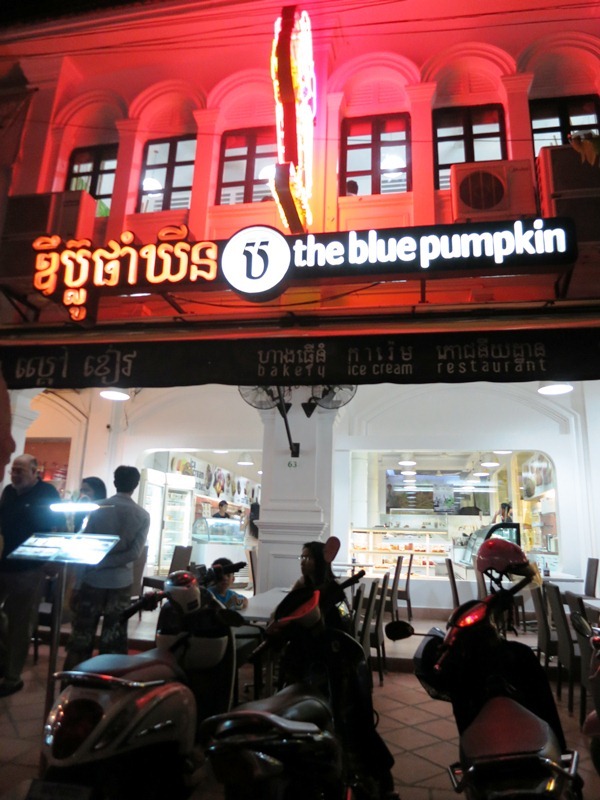 That’s how we found this The Blue Pumpkin (TBP). It’s a café, bakery and ice cream parlor all combined. We came to the cafe that’s located on the Pub Street, right across the street from the Old Market. Its first floor mostly used for their bakery while the cafe is located on the second floor. Yes, indeed they have super cool seats (and bean bags!) that allow you to lean comfortably and laying as long as you want. They provide portable laptop tables as well. It feels like you were on your own bed enjoying the cakes and mojitos. They have free fast internet connection too. 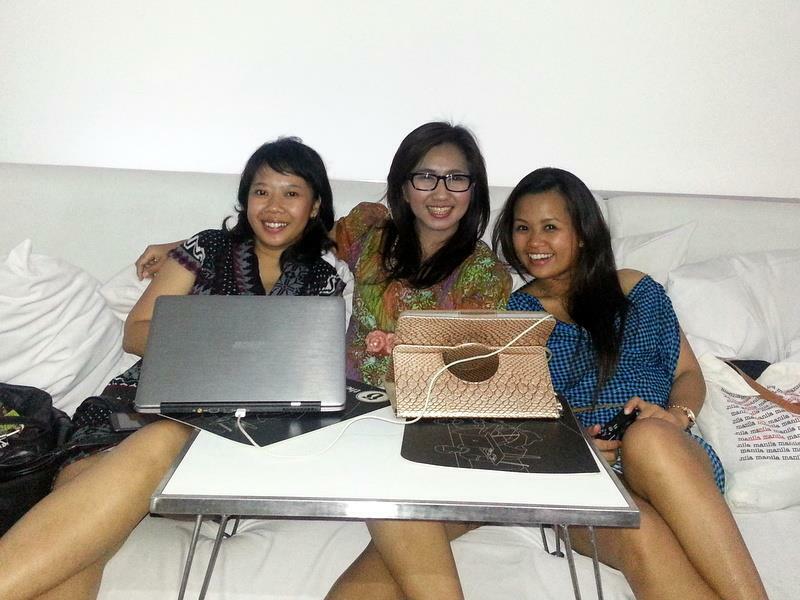 This is the place where we started a fun blogging tutorial to our Filipino friend, Kris. We love the cool seats! TBP cafe then became our favorite place to hang out. We love it too much as we visited the cafe three nights in a row. What to order from the cool cafe? Well, I’d highly recommend their Apple Tart. You can taste the fresh apples on top and also crunchy pie that melt on your mouth leaving a sweet and memorable sensation. I’m not good on describing foods’ taste as I can only taste “delicious” and “very delicious”. So, I’ll just let you imagine how its taste from the picture below. Aside from the cocktails, ice cream and cakes, they also serve various Western foods as well as the Asian foods. Chichi recommended the Four Spices Ice Cream: ginger, pepper, star anise, and cinnamon. I didn’t get the chance to taste it but so far I’ve heard someone said that, “words just can’t describe it”. So yes, I’d suggest you to try its unique flavors. 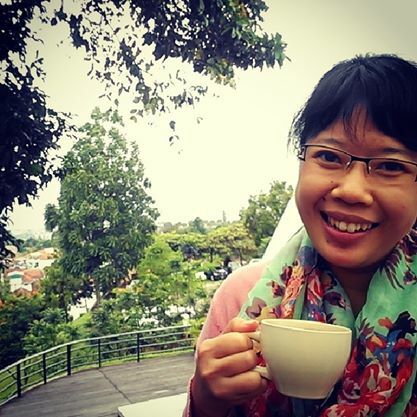 Later, we found that TBP also have several other cafes located in Siem Reap, airports and also in Phnom Penh. It’s a local business that successfully expands their branches around Cambodia. It does look like a really cool place. The food seems delicious too and the menu really unique. You made me really curious about this one. 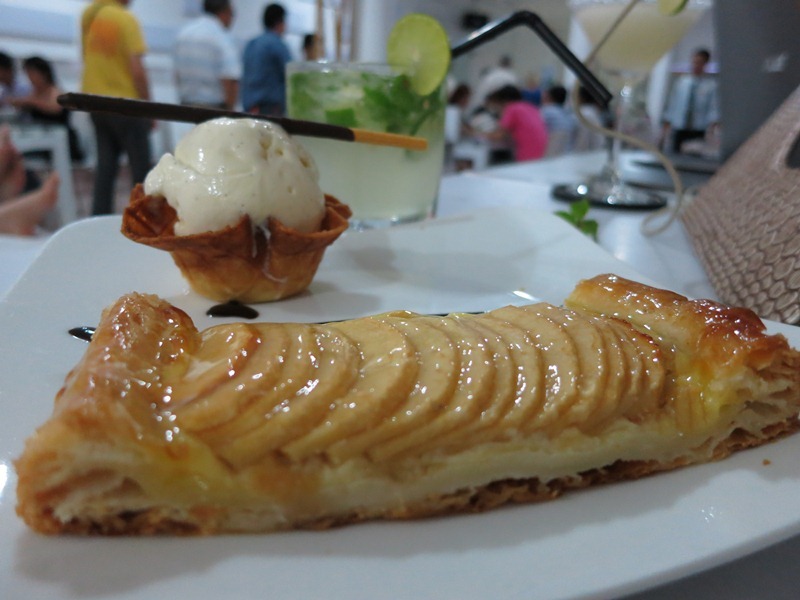 Thanks for this very insightful post, made me crave for the apple tart! This cafe really looks like a nice and cozy place to hang out.